The most important decisions when thinking about buying a new car are Efficiency, Ease & Design, so we built a video-enabled chatbot to help Maruti Suzuki converse with potential customers using a video chatbot. This interactive banner generated over 15million impressions, over 10 million+ views & invited over 2 million chat sessions between Maruti Suzuki and its potential customers. APAC first and Auto-industry first media property to address first level user queries. To an audience, an interesting ad is one that engages them in a story, immerses them in an experience, and triggers conversation. 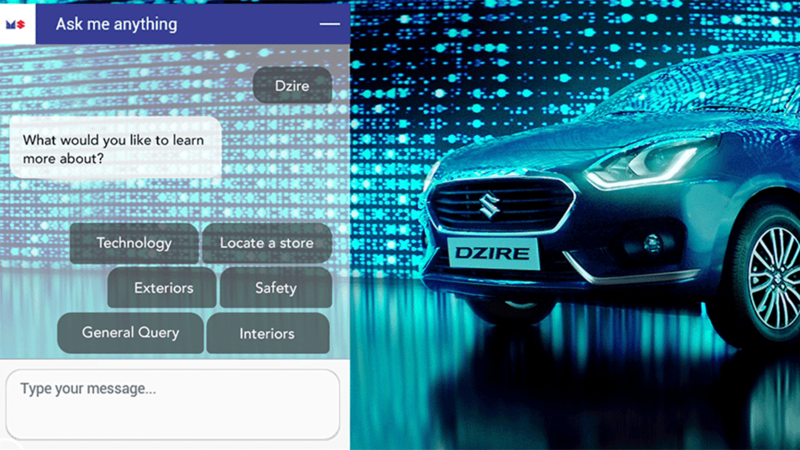 This lead to a key question: “What if a user could actually have a conversation with an ad?” By integrating an intuitive chatbot within the Launch TVC online, we were able to seamlessly answer a user’s immediate queries about the all-new Dzire. Enable a two-way communication while simultaneously driving consideration. This APAC first and Auto-industry first media property not only spread awareness about the launch of the all-new Dzire, but quite literally spoke with its target audience. Through this banner, users could view the Launch TVC while having all their first level queries entertained by conversing with chatbot built into the video.